(16/61) TRENTON – The Christie Administration today celebrated the official reopening of the Central Railroad of New Jersey Terminal at Liberty State Park following extensive repairs and renovations made necessary when Superstorm Sandy slammed the iconic building along the Hudson River in Jersey City. “The reopening of this historic terminal, through which millions of immigrants passed as they embarked on new lives in the United States, is indeed a momentous occasion,” said Department of Environmental Protection Commissioner Bob Martin during ceremonies at the terminal building. The nearly $20 million restoration of the building marks the next-to-last component of the park’s recovery, and has easily been the most complex, involving restoration of a unique piece of architecture that is more than 120 years old. The efforts that went into restoring this landmark are nothing short of miraculous and are testimony to our state’s resolve to rebuild from Superstorm Sandy. Today, the Central Railroad of New Jersey Terminal again takes its rightful place beside the Statue of Liberty and Ellis Island as America’s symbols of immigration, opportunity, national growth – and freedom. The state’s Corporate Business Tax funded $11.3 million of the work, and an insurance policy funded nearly $5 million. A National Park Service Sandy Disaster Relief grant provided $2 million and the Federal Emergency Management Agency provided $1 million. The park’s operating fund kicked in $576,000. Sandy’s record storm surge caused extensive water, electrical and structural damage. Mechanical and electrical equipment were elevated to avert future damage. The interior of the terminal, which briefly reopened in 2014 for the annual memorial observance of victims of the 9/11 terror attacks, was subsequently closed to allow for the additional interior work. Skylights, doors, windows, roofing and the structure’s distinctive cupola were repaired or replaced as part of exterior restoration. This phase was completed in 2014. 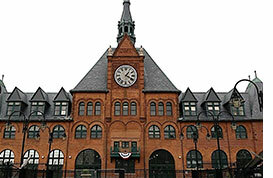 From 1892 to 1954, the Central Railroad of New Jersey Terminal served as the largest rail hub in the New York metropolitan area. Of the 12 million to 17 million immigrants who passed through Ellis Island during those years, approximately two-thirds embarked on their new lives on trains departing from the terminal. As many as 50,000 people per day used ferries and trains served by the terminal. 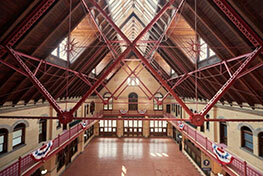 More than four million people per year visit Liberty State Park, which encompasses some 1,200 acres. It is the most popular destination in the state park system and, with the terminal reopening, has made a nearly full comeback from Sandy. Work still needs to be done on the interpretive center. Liberty State Park offers a two-mile waterfront walkway known as Liberty Walk, the 9/11 Memorial and Grove of Remembrance, the Liberty Landing Marina, the Green Park playground, nature trails, wildlife habitats and other recreational amenities. Hundreds of thousands of people use the ferries at the terminal to access Liberty Island, Ellis Island and Manhattan’s Battery Park. The park is celebrating its 40th anniversary. It was dedicated on Flag Day, June 14, 1976.